Additive manufacturing has a range of characteristics that suggest enhancements to sustainability should be possible. The nature of the process influences not only how products can be made, but also how they can be delivered. Logistics and the global supply chain are central aspects to manufacturing, and considerable attention is being paid to making the supply chain more sustainable. This often makes sound economic sense without any consideration of the environmental benefits, as this usually delivers energy reductions and reduced reworking or redelivery. Additive manufacturing has also secured increasing attention from a sustainability standpoint, but this has in the main focussed on the embodied energy of the products created, and the various aspects of the production processes used. Not all Additive manufacturing processes are parsimonious in their use of power. CAD/Cam design has long permitted global design collaborations, independent of the locations of the collaborators, with manufacturing located in the most advantageous location. 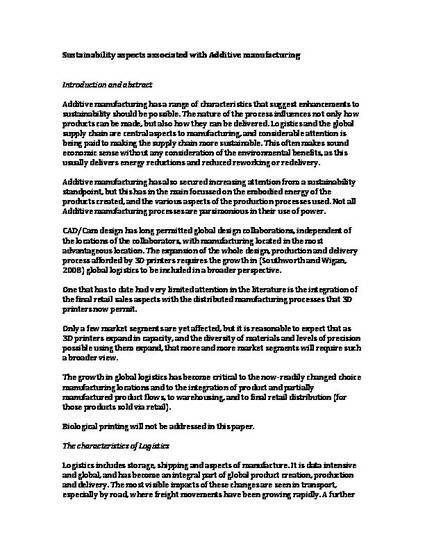 The expansion of the whole design, production and delivery process afforded by 3D printers requires the growth in (Southworth and Wigan, 2008) global logistics to be included in a broader perspective. One that has to date had very limited attention in the literature is the integration of the final retail sales aspects with the distributed manufacturing processes that 3D printers now permit. Only a few market segments are yet affected, but it is reasonable to expect that as 3D printers expand in capacity, and the diversity of materials and levels of precision possible using them expand, that more and more market segments will require such a broader view. The growth in global logistics has become critical to the now-­‐readily changed choice manufacturing locations and to the integration of product and partially manufactured product flows, to warehousing, and to final retail distribution (for those products sold via retail). Biological printing will not be addressed in this paper.